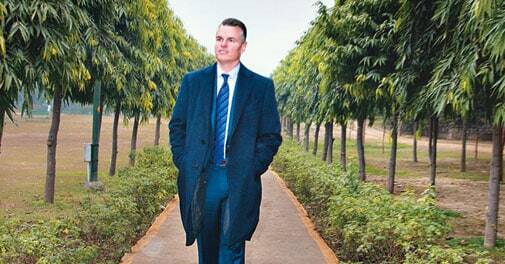 Jeff White is trying to change Cisco India from an equipment maker to a services and solutions company. About three years ago, engineering colleges at the Birla Institute of Technology and Science (BITS) faced a huge shortage of faculty. The problem extended across all four BITS campuses - Pilani, Goa, Hyderabad and Dubai. Unable to recruit more, BITS tapped its alumni network in technology companies for a solution. One alumnus, a senior executive in Cisco Systems, came up with the answer: virtual classes. He helped deploy TelePresence (TP) video conferencing services in each college and connected them so that professors at one college could take classes in other colleges without travelling there. "In the last one year, 37 courses have been taught across campuses over TP," says Rahul Banerjee, a computer science professor at BITS Pilani. "We are considering expanding our TP solution." Why is Cisco Systems, the world's biggest networking equipment company known for switches and routers, selling video solutions? The reason is purely economic. Over the years, the $48.6-billion technology giant's traditional business has been facing shrinking margins and low growth. Moreover, competition from Polycom, Juniper Networks, Hewlett-Packard and Palo Alto Networks is nipping at its heels, even though it still has the largest market. 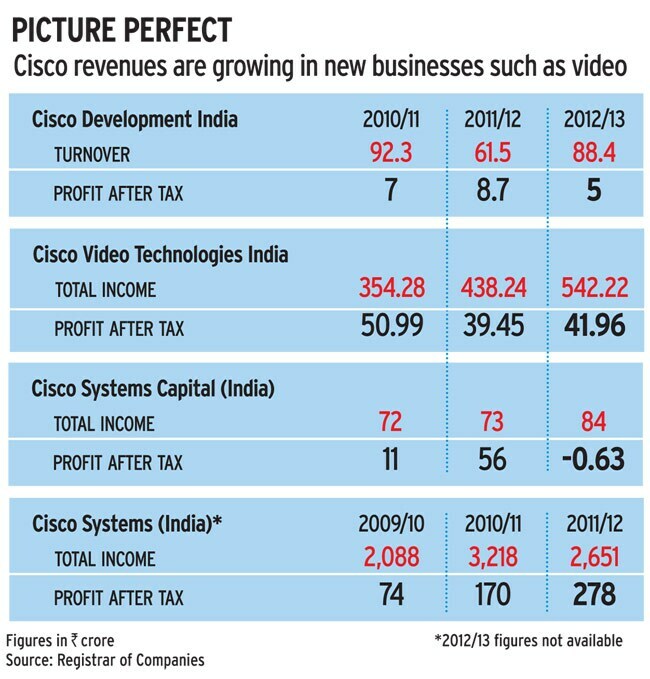 According to the Registrar of Companies, Cisco Systems India's revenue dropped 18 per cent to Rs 2,651 crore in 2011/12 while Cisco Video Technologies, part of Cisco India, grew 24 per cent to Rs 438 crore. Cisco did not comment if these numbers included all of its revenues from India. The writing was on the wall for Cisco: it had to think beyond its traditional business if it wanted to grow in an increasingly crowded industry. Globally, John T. Chambers, CEO of Cisco since 1995, has been trying to change the company into an IT services and solutions firm - and India also had to change. Chambers asked Jeff White, once in charge of Cisco's largest client American telecom operator AT&T, to take charge of the transformation of India in 2012. It was a time when consumption and technology were changing. White had one mandate when he came to India: growth. "John (Chambers) wanted the person who came into this role to have a very strong connect to drive those changes and do that quickly," says White. "We are here to generate growth." White is banking on Cisco's brand pull in the country. Sixty per cent of the mobile Internet runs on Cisco networks; stock exchanges, including the National Stock Exchange, and 24 of the top 25 banks use Cisco products. And 30 million households use Cisco to view cable and DTH television. But White knows new customers will not provide business only because of its legacy: "We have to go and demonstrate that we can make the transition." White is trying to change Cisco from an equipment maker to a services and solutions company. So far, the numbers have been impressive. White says Cisco's Indian units grew 37 per cent in 2012/13, making India the highest growth market for the company globally. Cisco declined to give comparable numbers for 2011/12 or estimates for 2013/14. New business from video, mobility, data centres, security, and wireless and WiFi contributed to this growth. Cisco is working with big telecom operators, including Reliance Jio, to build networks that will be able to deliver high-quality video and data services. It is also engaging with the central and state governments on health-care projects. It has set up 11 health-care centres with basic diagnostics equipment monitored remotely by doctors. "We are doing a pilot with the Madhya Pradesh government to provide remote healthcare through video communication," says Dinesh Malkani, who heads sales for Cisco in India and South Asia. It has partnered with various firms for its biggest bet - the Internet of Everything, a catch-all phrase that describes adding connectivity and intelligence to just about every device. One landmark project is Cisco's deployment of a single network platform across 150 Asia factories, including those of vendors, of US automaker General Motors. The engineering and manufacturing network has helped General Motors spend 30 per cent less time managing the plants' operations. San Jose-based Cisco's road to success hasn't always been a smooth ride. It tried to enter the consumer business by acquiring a small home WiFi/modem company called Linksys and showcasing its Cius tablet PC. But the moves did not work: Linksys was sold and the tablet project discontinued. In 2011, Cisco announced it would close its Flip camera business following the advent of smartphones. "Now they are branching out in areas which make sense," says Naresh Singh, Principal Research Analyst with technology research firm Gartner. White says the transformation, at least in India, is a three-year project. Cisco has invested more than $1 billion in the country, of which $200 million is in its clients. "We are very rigorously looking at the investments, the timing of those investments and the outcome of those investments," says White. Cisco's plans in India also involve massive investment in research and development. It has an R&D centre with 8,000 engineers in Bangalore who develop products such as video solutions, switches and routers, and security solutions. Cisco India owns two product lines - the Nexus 7000 and the MDS 9000 - which are highend data centre switches that help connect the world to data applications on servers. "Companies like Reliance are using the Nexus 7000 to build their data centre," says Joy Chatterjee, Senior Director, Switch Fabric Product Group at Cisco. About 50 engineers look after Cisco's top eight clients. "Engineers understand the customer's business, mindset and challenges," says Amit Phadnis, Vice President, Enterprise Networking Group at Cisco Systems. White is happy for now with the work of the research and development centre. But he wants to grow it further. Even though India is the main delivery centre for Cisco's clients globally, Indian clients account for just about two per cent of services delivery. "I would like to double that figure very soon," he says. This is possible only if White manages to increase Cisco's India footprint. One way is to get Cisco solutions in mobile phones. Its acquisition of Jabber, the instant messaging and video tools for enterprises, will play an important role. Cisco has already signed a contract with India's largest bank, State Bank of India, to offer video and collaboration over mobile phones to its employees. "We can hold a videoconference directly from the desktop and executives don't have to move anywhere, improving our time efficiency," says Dinesh Kumar Khare, CEO of SBI Mutual Funds.